Does Your OCD Conflict With Your ADD? Do you find yourself bouncing from one thing to another? I do. I have always had eclectic tastes and my interests are wide and varied. 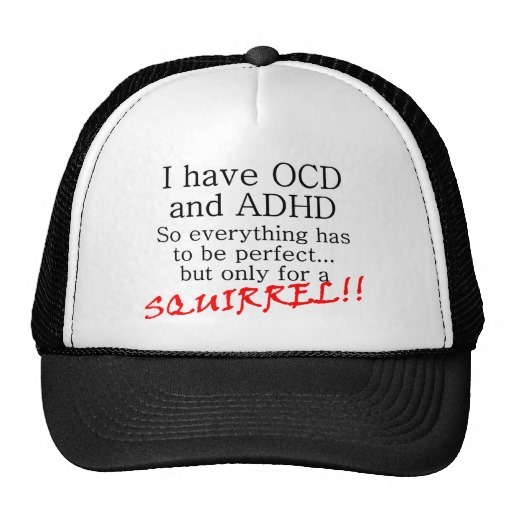 Couple that with being a bit of OCD in some respects and a little ADD in others, and you get . . . where was I? Seriously, I have long referred to myself as a stimulus magnet. For instance, I was never able to work anywhere near peak capacity if I listened to music, especially if lyrics were involved. It wouldn’t take longer than a minute or two before I’d be tapping my feet and wanting desperately to sing — which, of course, when sitting in a cube farm is not really a good thing to do. A long time ago, I used to play a game with two friends where we would sit on a couch and the two on the outside would carry on separate conversations with the one in the middle. These conversations had to be more than just idle chit-chat as well; otherwise, it wouldn’t have been much of a challenge. I was pretty good at it and, in retrospect, I’m sure it helped me be able to multi-task, which we all know isn’t possible, except it actually is. I will, however, accept that doing so does reduces each task to being a little less efficient than it would otherwise be if one were to concentrate solely on it. The advent of the Internet hasn’t made me more focused either. Like many people I know, my browser normally has a couple of dozen tabs open. Part of it is probably just related to my being an information pack rat, and my having a difficult time closing something interesting. I have a hard time escaping the nagging feeling that I’m going to want that document/page shortly after I close it, knowing if it’s any more than an hour or two afterward I’ll have difficulty finding it in my browsing history. I could bookmark it, and I often do, but that’s no guarantee I’ll either remember I did so or will be able to easily find it later. I also bounce around a fair amount as a word, phrase, or sentence sends me scurrying off to find out more. Thankfully, Chrome includes the ability to highlight a word, right click on it, and look it up in the dictionary. The results also include info from wikipedia and a thesaurus as well . . . most of the time. This is becoming more and more useful as my internal dictionary and thesaurus are suffering from wear and the inevitable gumming up experienced as one ages. Frankly, I don’t know if others experience these things, or if some of it is age-related as most of my online friends are considerably younger than I am. I’d send out a survey, but I’m quite certain it would piss off too many people or I would just be ignored . . . as I so frequently am normally. All this greatly affects my ability to concentrate and causes me to constantly struggle to focus. Do you experience this? Is it just normal nowadays, given the firehose of information we are all inundated with via our computers, notebooks, and smartphones? I don’t think I’m the only one who deals with this, but I’m not entirely certain.